Cloud computing is a pretty important “thing” these days. Although personally I don’t feel that safe if I “host” all my data on someone else’s computer on a remote location. Anyhow, Ubuntu in this case has been sneak-peeking into the word of cloud computing for sometime now and they’ve built some solid “framework” which is called Ubuntu cloud. 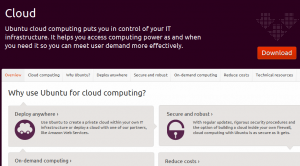 All the Ubuntu users will get a free cloud account (including few Gigabytes of data for free) and Ubuntu Linux is optimized for data sync between their cloud module and the local computers but to get the most out of it you’ll have to upgrade accounts to premium ones (means $$). 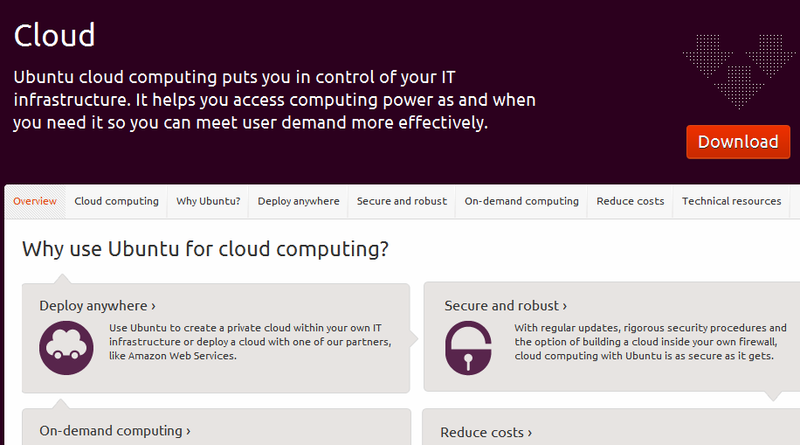 Ubuntu is not the only one who’s “interested” in the cloud. Of course other GNU/Linux distribution developers do have their own project pumped up already. But there is an open community project called OpenStack. And in a way all the other GNU/Linux cloud projects falls inside of OpenStack. What the heck is OpenStack? OpenStack is a cloud infrastructure (sort of an operating systems) that literally manages a massive cloud environment. Well in basic terms, a cloud infrastructure is a framework that lets you manage/connect different types of cloud modules. For instance if you have a cloud based on Microsoft technologies, one with Apple + another one with Ubuntu … then by using a infrastructure such as OpenStack you can interconnect them!. Ubuntu, MS Windows or other OS will run inside of it. So from an open-source geeks’ point of view, OpenStack is the “mother-ship” of a truly open cloud system :). A lot of computer vendors have a growing interest in Ubuntu rather than in GNU/Linux in general, and when it comes to choosing a GNU/Linux guest OS, going with Ubuntu makes sense since as said before, they’ve already built a solid platform and even has a cross-platform Ubuntu One utility that runs in Windows, Ubuntu, iOS and Android that makes the data sync between then a breeze as well. But the question remains … will Ubuntu be able to stand up to the challenge?, only time will tell.